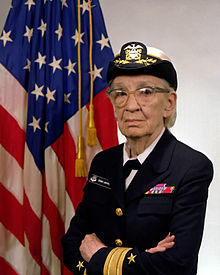 Grace Brewster Murray Hopper ( December 9, 1906 – January 1, 1992) was an American computer scientist and United States Navy rear admiral.In 1944, she was one of the first programmers of the Harvard Mark I computer and invented the first compiler for a computer programming language.She popularized the idea of machine-independent programming languages, which led to the development of COBOL, one of the first high-level programming languages. Owing to her accomplishments and her naval rank, she was sometimes referred to as “Amazing Grace”.The U.S. Navy Arleigh Burke-class guided-missile destroyer USS Hopper was named for her, as was the Cray XE6 “Hopper” supercomputer at NERSC. On November 22, 2016, she was posthumously awarded the Presidential Medal of Freedom by President Barack Obama.